Hey there, Shocktoberphiles! Yes, I have once again agreed to help John out this Shocktober by reviewing a few classic horror movies, though last year established quite clearly that I am not the most horror-minded film fan, as the two films I got the most excited about reviewing were Eraserhead and Young Frankenstein. And it appears that I’ll probably end up taking that same route this year, as this first film I’m reviewing isn’t really quite a horror movie, though I can see why John chose it as part of this year’s Shocktober itinerary, since it has some supernaturally ghoulish elements to it. However, calling this a horror movie feels a bit like calling The Seventh Seal a horror movie (more on that later). But you know what? 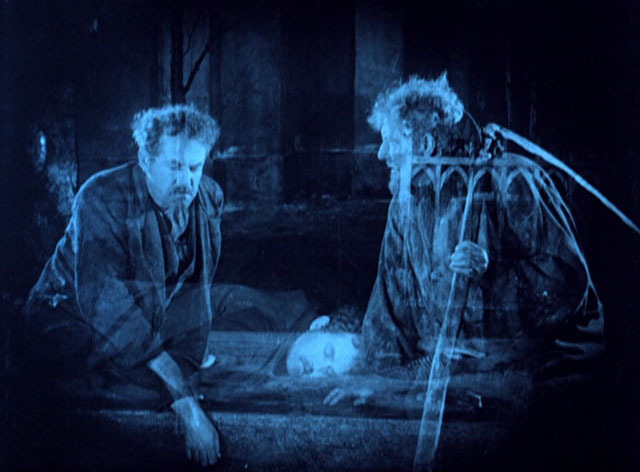 I don’t really care, since it’s doubtful that I would’ve gotten around to seeing this movie any time soon if it wasn’t for Shocktober, and The Phantom Carriage is a pretty amazing achievement in silent European cinema no matter how you slice it. Adapted from a novel by Pulitzer prize-winning Swedish author Selma Lagerlöf, The Phantom Carriage all takes place on New Year’s Eve, and begins by focusing on a dying Salvation Army sister named Edit (played by Astrid Holm), who’s last wish is to see a man named David Holm (I guess Holm was a pretty common last name among the Swedes). We then see David (played by director Victor Sjöström), who’s basically a drunken tramp at this point, hanging out at a graveyard with some of his jolly downtrodden brethren, while reminiscing about his departed friend Georges, who once told him the legend of how the last person on Earth to die before New Year’s Eve must drive Death’s chariot and go around for the next year collecting the souls of those who die throughout that year. Then moments later, as the clock is about to strike midnight and the new year is about to begin, a friend of Edit’s comes to David, begging him to see Edit, though David refuses. A fight then breaks out between David and his tramp buddies, and one of them accidentally smashes a broken bottle on David, killing him and thus sending him into the afterlife right before the clock strikes midnight. As you might’ve guessed, this summons David’s old buddy Georges, who now dawns the cloak and sythe of Death, while David must confront his own demons in the process of convincing Death to let him live. It’s a pretty intriguing set-up, even it is feels a bit like A Christmas Carol, but if A Christmas Carol took place a week later, as David spends this New Year’s looking back at the different relationships in his life, and how he’s squandered whatever good things he’s been given. And I think a big reason why I was able to watch all 104 minutes of this movie (pretty long for a silent film IMO) in one sitting, is the complexity of the plot. Due to the film having to constantly revisit earlier events in both Edit and David’s life, we get flashbacks as well as flashbacks-within-flashbacks that are still a bit dizzying to try and follow story-wise even a 100 years later, which makes me feel both quite dumb and quite impressed with this film at the same time. Along with The Cabinet Of Dr. Caligari (another somewhat morbid piece of European filmmaking from around the same period) it just kind of amazes me that even when the idea of making movies was in this early, primitive state, directors like Victor Sjöström were already pushing the limits of what could be done with film as a storytelling medium. 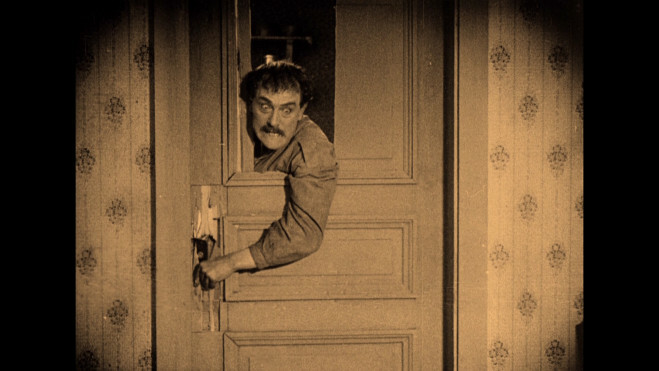 Also, like a lot of the great films of the silent era — because of course they had to get creative without the use of sound — the film visually is pretty impressive on both a technical level and for its evocative imagery. To make the characters of David and Death appear more ghostlike, the cinematography features extensive use of double exposure, which forced the camera operator to overlay images within the camera over pre-existing scenes in order to create a transparent effect. This now-pedestrian technique might seem a bit hokey at first, but starts to feel pretty seamless as the film does an effective job of letting Death and David interact with the films’ more Earthbound characters. Also, the imagery of Death in human form is more than a little haunting, which is perhaps best exemplified by Death’s arrival following David’s initial descent into the afterlife, which features a super eery use of prickly strings on the soundtrack (the one I heard was the 1998 version done by composer Matti Bye), which is truly the stuff of nightmares. Another one of the film’s striking images appears early on in the film, as we see Death driving his silhouetted chariot across the Swedish countryside, which bears more than a little resemblance to the final shot of Ingmar Bergman’s landmark The Seventh Seal. This of course is no coincidence, as Bergman has cited The Phantom Carriage as having a profound influence on him as a filmmaker. Which happens to be about all I knew about this movie coming into it, since I’ve always regarded Bergman as my favorite foreign director (and one of my favorite directors period), though I’ve always been a bit of a noob when it comes to silent-era cinema. And it probably also speaks to this film’s influence on Bergman that ‘ol Ingy cast its director Victor Sjöström as the lead in one of his masterworks, 1957’s Wild Strawberries, which also has some similar themes of a man looking back on his life with an undercurrent of regret. Also, I have to imagine The Phantom Carriage had an impact on Bergman because it often feels a bit more “real” than a lot of silent movies. I mean sure, the movie is pretty high concept and does feature its fair share of of overphysicality in the acting department. But at the same time, Sjöström often lingers on actors’ expressionless faces, which he surely recognized where the most effective kinds of faces for characters that were literally staring into the face of death. There’s also something that still feels a bit timeless about this story of a man who keeps making mistakes in spite of trying to do the right thing, and the film would be almost perfect if it wasn’t for its not-quite-earned happy ending (though one’s feelings on it will probably depend on whether you believe a crappy human being can ever really change). And since I don’t have any sort of profound rumination to leave you with that entails life or death or any of the other existential themes the film covers, I’ll just leave you with a couple fun facts: The film was released on New Year’s Day 1921 (the day it takes place on!) Also, maybe The Phantom Carriage is deserving of a place in horror movie lore after all, since its climactic scene was clearly lifted by Kubrick for one of the more iconic scenes in The Shining.